In Lesotho developments in education have seen the introduction of policies and long-term strategic initiatives designed to improve teaching during the foundational years of schooling. The Education Sector Strategic Plan 2005-2015 (2005) states that the Ministry of Education and Training is engaged in expanding Integrated Early Childhood Care and Development (IECCD) centres in the entire country. This expansion is evident, in part, from the introduction and attachment of Grade R classes to already-existing primary schools. To date, 247 Grade R classes are attached to primary schools. This sustained focus indicates that early childhood education (ECE) is gradually being recognised in Lesotho, and Basotho children are increasingly enrolling in different IECCD centres. The enrolment rate of children aged 3-5 years in different IECCD centres has increased: in 2000, 30 540 and in 2002, 41 469 were enrolled, an increase of 38.8% (Education Sector Strategic Plan 2005-2015 2005:31). This increased enrolment is an indication of Lesotho recognising the importance of Grade R classes' preparation to their children's development, which includes learning in subjects such as mathematics. Policies that attempt to make improvements to education, however, are not easily implemented because of a myriad of challenges, including resources, management and teacher training, as well as teacher support. The success of the implementation of a policy will require the identification of possible challenges, which can then be addressed. This article seeks to identify challenges related to the teaching of numeracy by exploring the mathematical knowledge for teaching (MKT) of numeracy of a sample of 48 practising Grade R Lesotho teachers who were enrolled in a teacher development programme. The research question that guides this study is: What do Grade R teachers' written responses to a questionnaire reveal about their MKT of numeracy? It is hoped that the study may provide information that may assist the education authorities in Lesotho in their planning and provision for ECE. The study could also contribute in general about teacher knowledge in the field of teaching numeracy. In this literature review we first examine why MKT is important. We then focus on particular issues related to the teaching of numeracy at Grade R, including an elaboration of the numeracy content for Grade R learners in Lesotho, as well as considerations for the effective teaching of numeracy. Ball and Bass (2000), in exploring the content knowledge needed for teaching numeracy, focused on analysing teachers' actual teaching practice of teaching numeracy. Their analysis concentrated on how teachers use content knowledge during the numeracy instruction. Findings revealed that the real-life teaching practice of numeracy entails different kinds of knowledge, which require teachers to be knowledgeable and competent. A deep understanding of the content knowledge is necessary because it affords them an opportunity to incorporate practices like understanding and interpreting learners' responses; anticipating uncertainties, regularities and challenges that might occur during the teaching and learning process; deciding on how to present the content and to modify the curriculum, materials and instruction. Ball and Bass (2000) emphasise that all of these capabilities demand teachers' knowledge and competence in the subject matter because that knowledge is fundamental to interpreting learners' mathematical thinking as well as in integrating it with practice and learners' experience, interests and needs (Ball & Bass 2000). Hill, Rowan and Ball (2005) concluded that there was a relationship between teachers' mathematical knowledge and learners' achievement and reported that teachers' knowledge for the teaching of numeracy had a positive influence on learners' gains in Grades 1 and 3. Hill et al. (2008) provided support to the findings of Hill et al. (2005), stating that 'there is a powerful relationship between what a teacher knows, how she knows it and what she can do in the context of instruction' (Hill et al. 2008:496). Hill et al. (2008) emphasise that their participants in the study, with high knowledge of content, were able to present quality instruction because they skilfully responded to learners' questions, they provided rich mathematical examples and they ensured that all learners were afforded equal opportunities to learn and were able to contextualise the numeracy content. Shulman (1986) indicates that possessing knowledge of the facts and concepts of the subject matter alone is insufficient. To deliver effective mathematics instruction, teachers need to have sound content knowledge and also pedagogical content knowledge (PCK) (Shulman 1986). For example, in the case where learners are asked to perform rational counting (the counting of physical objects matching number names with objects), from 1 to 10, a common error that learners may make is to say the number words in sequence while randomly pointing to objects, without knowing when to stop counting. They may even count some objects more than once (Department of Basic Education 2012). Threfore in order for young children to acquire knowledge of number names, they need to be made to repeat those number names (rote counting) several times for them to remember (social learning). It is through this type of counting that learners develop a sense of muchness of a number (Department of Basic Education 2012). Teachers need to be able to detect those errors that are likely to be demonstrated by learners. However, teachers who lack knowledge of numbers experience challenges in anticipating possible errors that learners may portray while performing rational counting. Numeracy content encompasses more than just counting. Many teachers across the world believe that when engaging learners in activities like building blocks and puzzles and singing counting songs, they are teaching numeracy, and they sometimes do not recognise that numeracy content is also embedded in other activities such as reading, gross and fine motor activity (Clements & Sarama 2011). Ginsburg and Ertle (2008) elaborate that the breadth of numeracy implies that it involves big ideas of mathematics, namely: number, operations and relationships, patterns, space and shape, measurement and data handling, each of which comprises different topics that are interrelated (Ginsburg & Ertle 2008). The topic of 'Number Operations and Relationships' includes subtopics like counting concrete materials and counting number symbols. The knowledge in these subtopics is also applied in the topic 'Comparing and Ordering Numbers'. Learners' understanding of the value of the number will help them to compare between given collections of objects and to say which collection is big or small. Another topic is 'Addition and Subtraction'; this topic also requires learners to possess knowledge of counting skills and number value in order to be able to solve problems and be able to explain how they solved the problem (Department of Basic Education 2012). Measurement, another topic in numeracy, includes subtopics such as time (requires learners to talk about passing events), length (demands of learners to informally measure objects, compare and order objects according to their height and length using words like long, longer, short and shorter), mass (where learners informally compare and order objects by feeling them or by using a balance scale), as well as capacity (where learners are required to compare and order amounts of liquid in containers using words like full and empty) (Department of Basic Education 2012). In terms of the preparation of teachers for the teaching of numeracy in Grade R in Lesotho, the Grade R teachers' training curriculum and numeracy curriculum for Grade R learners is described. The Numeracy Curriculum for the Certificate in Early Childhood Education (CECE) programme offered by the Lesotho College of Education, during the training of Grade R teachers, requires that they acquire knowledge and skills that will be useable in promoting effective early development of numeracy (mathematics) amongst Grade R learners. The synopsis and objectives of the curriculum emphasise that Grade R learners, already in their early childhood years, use numeracy concepts in their daily vocabulary as a result, and teachers' role is to facilitate the process of discovery and exploration of the relevant numeracy concepts. The curriculum, therefore, demands that Grade R teachers be equipped with the basic numeracy concepts, methods and techniques to be used when teaching numeracy to Grade R learners (CECE Programme 2007). The curriculum requirements of teachers indicates that they need to possesses both common content knowledge (CCK) and specialised content knowledge (SCK) (Ball, Thame & Phelps 2008) so that they are able to facilitate discovery and exploration of numeracy concepts in a manner that affords learners different contexts to use and apply the concepts on a daily basis. Literature indicates that the numeracy curriculum of ECE should encompass all five major areas of mathematics, namely numbers and operations, geometry, algebra, measurement and data analysis, because Grade R learners develop numeracy concepts concurrently across the five major areas (Ginsburg, Lee & Boyd 2008; NCTM 2013). The IECCD Curriculum for Reception Class (Grade R) draft (2007) stipulates only three major areas of mathematics, namely: number and operations, measurement and shapes, with a list of topics and content under each area. The curriculum seems to lack features such as suggested activities or teaching strategies to guide teachers, objectives and it also does not indicate the sequence and depth of the topics to be taught. Two major areas of mathematics, algebra and data analysis, are excluded in both curricula, the Numeracy Curriculum for the CECE programme, which is used during the training of Grade R teachers and in the IECCD Curriculum for Reception Class (Grade R) (draft), which is used by Grade R teachers in planning their numeracy instruction for Grade R learners. The numeracy descriptions highlighted in this review indicate that numeracy content for a Grade R class is broad (Clements 2001). The connection and interrelationships that exist amongst the mathematics topics require teachers to have a sound knowledge of the subject matter (Shulman 1986). The breadth of the content also demands of teachers to demonstrate both CCK and SCK (Ball et al. 2008) during the actual teaching of numeracy. They should furthermore be able to present the numeracy topics in a manner that connects them to the previously taught topics or the future topics and also to link and unpack the underlying ideas within the concepts (Ball et al. 2008). Greenes, Ginsburg and Balfanz (2004) discovered that learners informally learn different numeracy concepts; as a result, they need to be exposed to a broad content of numeracy including space, shapes, pattern, number and operations. Henning (2014) agrees with Ginsburg et al. (2008) that children from birth to age five develop an everyday numeracy including informal ideas of concepts like more, less, taking away, shape location and positions. Learners have a spontaneous interest in numeracy concepts. For instance, while playing at the block corner, learners spend time determining whether one tower is higher than another, or they spend time on creating and extending patterns with blocks or shapes. This implies that free play sets a platform for learners to explore and informally learn numeracy concepts (Ginsburg et al. 2008). The review indicates that teachers need to possess knowledge of students (learners) and content (KSC) (Ball et al. 2008) in order to be able to design teaching instructions that build on learners' prior knowledge, because that will facilitate connections between learners' informal knowledge and formal knowledge of the numeracy concepts (Mathematics Learning Study Committee 2001). We now briefly focus on the effective teaching of numeracy. Shulman (1986), in his seminal work on PCK, emphasises that in order for teachers to practise effective teaching, they need to possess knowledge of the subject matter because it is crucial and central to effective teaching. Atweh et al. (2014) subscribe to Shulman's notion by stating that effective teaching can be achieved by connecting teaching instruction to the context of learners and by affording learners opportunities to explore interactive numeracy activities that promote learners' development. The Mathematics Learning Study Committee (2001) similarly indicates that effective teaching of numeracy depends on the interdependent interaction between numeracy content, teachers' devotion to work with learners and the involvement of learners in numeracy activities. This implies that teachers should intentionally plan and present quality numeracy instructions by selecting numeracy activities that stimulate learners' cognitive development; by motivating learners to learn and value the numeracy content; by listening to and understanding expression of learners' numeracy ideas and to then provide appropriate responses; by interpreting learners' work and then analysing their reasoning; by appreciating different methods learners use in solving a problem and by adapting and adjusting numeracy content to be suitable to all learners (Mathematics Learning Study Committee 2001). Opdenakker and Damme (2006) also maintain that apart from the positive interdependent relationship, which contributes to effective teaching of numeracy, a learner-centred teaching style should also be promoted. Lim and Chai (2008) state that not being learner-centred means that the cognitive dimensions of learners were neglected. Teachers should note that school knowledge and learning is complex and takes time to occur and also to adjust; as a result, they have to sequentially organise activities that will help students to learn the intended subject matter. Rusznyak and Walton (2011) suggest that to enhance conceptual learning, teachers should also ensure that there is a link and progression between what is taught and the end results because that shows systematic learning, which enables students to comprehend content more easily. In addition to struggling with teaching mathematics in general, preservice teachers are also trying to find their way through curriculum changes. The Mathematics Learning Study Committee (2001) indicates that effective teaching of numeracy assumes many different shapes because it focuses on fostering and maintaining the development of numeracy proficiency over time. It also depends on the mutual and interdependent interaction of the numeracy content, the teacher and the learner during the teaching practice. Looking at these different concepts that signify effective teaching, there are two aspects that contribute to and promote effective teaching of numeracy in any Grade R class. The two aspects are intentional teaching and the use of teaching and learning materials. Intentional teaching is an aspect that teachers need to practise in order to respond to effective teaching of numeracy in Grade R classes. Epstein (2007:1) explains that intentional teaching means that 'teachers act with specific outcomes or goals in mind for children's development and learning'. Epstein (2007) further discusses how intentional teaching promotes the integration of numeracy with other domains like literacy and science; as a result teachers need to be knowledgeable about different levels of learners' development and be able to employ the best teaching strategies, which optimise the learning of numeracy. Jung and Gregory (2013) indicate that teachers need to practise intentional teaching by providing authentic numeracy instruction and designing numeracy activities that are purposeful and meaningful to learners. Jung and Gregory (2013) highlight that authentic activities allow numeracy to be connected to learners' real-life experiences. Taking weather patterns as an example, at the beginning of the month, the teacher may ask learners to predict which weather will occur most often and to record their predictions. Maybe, most learners will say 'sunny weather' and others may predict 'windy weather'. So during the entire month the learners post daily weather data on weather charts with the intention of testing their predictions. In this way the weather routine has more meaning to learners and they have the opportunity of finding out if their predictions were correct or wrong (Jung & Gregory 2013). The second aspect captured as a positive contributor in effective teaching of numeracy is the use of teaching and learning materials. Moyer (2001) indicates that teaching and learning materials are objects used to represent, explicitly and concretely, numeracy concepts that are abstract. Moyer (2001) emphasises that the advantage of the use of teaching and learning materials is that they provide visual and tactile appeal; as a result, they afford learners an opportunity to manipulate them. Jung and Gregory (2013) indicate that the use of teaching and learning materials or manipulatives during the teaching of numeracy yields productive results because young learners who used manipulatives to solve numeracy problems outperformed their peers who did not use them. However, the Mathematics Learning Study Committee (2001) argues that for the effective use of manipulatives during the teaching and learning process, teachers need to interact meaningfully time and again with learners in order to help them to connect between the manipulatives and numeracy concepts or operations being presented. Failure to facilitate this connection may create challenges for learners, because they may fail to look at those manipulatives the same way as teachers do; as a result learners may not learn the numeracy concepts or operations that teachers may have intended to teach (Learning Study Committee 2001). The review above reveals that effective teaching relies on the quality and quantity of interaction between the content, teacher knowledge of the content and teachers' involvement with learners. Therefore, it is evident that in order for teachers to practise effective teaching they need to have CCK and KSC (Ball et al. 2008). This knowledge will help them to present thoughtful, planned numeracy lessons that accommodate all learners and respond to their differences in terms of their abilities, interests, needs and backgrounds (Learning Study Committee 2001). The review has shown that teaching numeracy at Grade R level is much more complex than just helping learners to start counting. Grade R numeracy teachers need to develop the different facets of MKT, which requires specialist training and professional development. These training programmes need to be informed by research. However, there has been no research conducted in Lesotho about MKT numeracy amongst Grade R teachers, and this study is intended to fill this gap. We now present the practice-based theory of content knowledge, which unpacks the different mathematical knowledge that Grade R teachers need to use during the teaching and learning of numeracy in Grade R in Lesotho. The theory employed in this article stems from the work of Shulman (1986), who suggested that teachers must possess professional knowledge encompassing subject matter knowledge, PCK and general pedagogical knowledge. Ball et al. (2008) had an interest in the work of Shulman and they have expanded Shulman's work by suggesting conceptualising Shulman's professional knowledge; Ball et al. (2008) claim that they are too broad and inclusive to specify professional knowledge for teaching, particularly in terms of math instruction. They ask questions like: how does a researcher operationalise the term 'PCK'? How can he or she distinguish the PCK from other forms of knowledge such as content knowledge or pedagogical knowledge, teacher beliefs or attitude? Ball et al. (2008) therefore recommend that concepts involved should be defined because they will offer researchers a better understanding of the nature of the content knowledge for teaching. Ball et al. (2008:395) use the term 'MKT' to refer to 'the mathematical knowledge needed to carry out the work of teaching mathematics'. Their perspective is that MKT comprises two domains, which are 'subject matter for teaching' and 'PCK'. 'Subject matter for teaching' has been further divided into two subdomains, 'CCK' and 'SCK'. CCK refers to 'the mathematical knowledge and skill used in settings other than teaching' (Ball et al. 2008:399). SCK is 'the mathematical knowledge and skills unique to teaching' (Ball et al. 2008:400). The next division was PCK, which was divided into two subdomains: 'knowledge of content and students' (KCS) and 'knowledge of content and teaching' (KCT). 'Knowledge of content and students' refers to 'knowledge that combines knowing about students and knowing about mathematics' (Ball et al. 2008:401), while KCT is a blend of 'knowing about teaching and knowing about mathematics' (Ball et al. 2008:401). The above four subdomains are used in this article to explore practising Grade R teachers' MKT numeracy. The purpose of this study was to explore Grade R teachers' mathematical knowledge for the teaching of numeracy. The study took on an interpretative approach because of the emphasis on understanding the perspectives of the Grade R teachers. The participants were a class of 48 Grade R teachers who were enrolled in the second year of study of an in-service programme called 'CECE' offered at a Lesotho College of Education. Data was drawn through the use of a questionnaire comprising 14 questions, which were categorised within the four subdomains of knowledge derived by Ball et al. (2008). Questions about the CCK focused on the teachers' ability to recognise when learners give wrong or right answers; to use mathematical terms and notations correctly and also the ability to do the work they assign to the learners. For SCK, the questions explored teachers' capabilities to use suitable examples and materials to present numeracy content, or their abilities to adjust the content to be either easier or harder. Questions asked about the teachers' KCS focused on exploring the teachers' knowledge and ability to anticipate what learners are likely to think and confuse, and their ability to anticipate whether learners will find assigned tasks easy or difficult. For KCT, questions focused on exploring teachers' understanding and ability to decide on appropriate teaching methods. This article focused on 6 of the 14 questions, whose responses required knowledge of the four subdomains of mathematics knowledge with respect to concepts in numeracy. The analysis of the data involved first coding each item according to the subdomains that they were relevant to, and thereafter the responses to each item were categorised according to particular categories relevant to the domain itself. The presentation of the results and the discussion is organised under the four domains of MKT that are included in the overall MKT framework presented by Ball et al. (2008). These are 'CCK', 'SCK', 'knowledge of students and content' as well as 'KCT'. For each section we first present a description of the knowledge domain, which is followed by the details of the items that are situated in the particular domain. Thereafter broad trends in the teachers' responses are outlined before focusing on specific issues emerging from the written responses. CCK refers to 'mathematical knowledge and skills used in settings other than teaching' (Ball et al. 2008:399). It includes abilities such as being able to identify right or wrong answers, using correct terms or notation and simplifying the work assigned to learners. To explore Grade R teachers' CCK, we asked questions such as, 'List the even numbers that are between 1-20'; 'Write the following in number word[s]: 255 then divide the number you have written in number symbols by twenty-five and provide the answer'. The questions required no special understanding beyond a knowledge of numbers and their operations such as division, which is knowledge that is common to ordinary people who know some mathematics. The findings revealed that 87% of the teachers were able to list the even numbers between 1 and 20. However, 13% of the teachers experienced some challenges in this regard. For instance, Teacher 1 included all counting numbers between 1 and 20 (see Figure 1). Teacher 2 provided a list of some of the odd numbers that are between 1 and 20 instead of even numbers. However, as is evident in Figure 2, the list did not include all odd numbers. 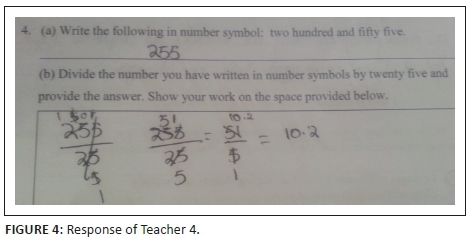 In a second question in this domain, teachers were asked to write a number word as a number symbol (255) and to then divide the number that they had written by 25. The overall results of this question revealed that 87% of teachers were able to cope with this question. However, 13% of teachers seemed to have different understandings and knowledge in this regard. Some teachers made the error of writing two zeros at the end of the number, which resulted in changing of the value of the number into 25 500. Another error was the inclusion of the decimal point between the number and the two zeros as the last digits of the number. Some included the letter M, which stands for the local currency (maloti), effectively resulting in an amount of money and not a number. Fewer teachers were able to produce the correct answer to an extension of the second question (requiring teachers to work out the division of the number by 25). Only 62% of teachers seemed to understand the division concept and were able to show their work. 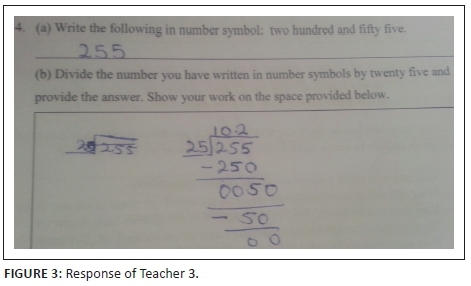 For instance, the response of Teacher 3 appears in Figure 3, showing her correct answer. Teacher 3, when dividing 255 by 25, used the long division method, which allowed her to apply knowledge of different notations like subtraction and addition in order to get to the correct answer of the question. This teacher was able to arrive at the correct answer by applying the procedural knowledge of the long division strategy. A different strategy used by Teacher 4 appears in Figure 4. Teacher 4 opted for the short division method, which requires some conceptual understanding of the process of division and place value. Both Teachers 3 and 4 seemed to have knowledge and understanding of the algorithms that are involved in the process of division. However, 38% of the teachers were unable to carry out the division task correctly. 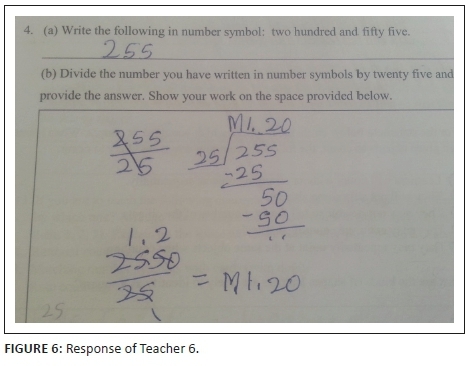 For instance, the response by Teacher 5 in Figure 5 illustrates some confusion. Teacher 5 was confused when applying the short division method. He ignored the place value implications and indicated that 25 'went into' 255 by a factor of 1 instead of 10. Secondly, when continuing, he correctly realised that 25 'went into' 50 by a factor of 2; however, he was not able to correctly represent this relationship. As a result, he omitted a step whereby he would have written 0 next to the answer 1, a decimal point after the 5 and a 0 next to the remaining 5 to represent 5.0, which could then be divided by 25 to produce 0.2. Consequently, his answer was 1½ instead of 10.2. Teacher 6, in solving the division task, showed her work as illustrated in Figure 6. The work of Teacher 6 shows that she added a decimal point to the answer and changed the status of the number into a monetary form by adding M, which stands for maloti. The finding indicated that while some teachers have CCK, others show serious gaps in the basic concepts. As a result this may have an adverse effect on their teaching of numeracy; for example, they may not recognise common errors that learners may show and as a result they will not be able to assist learners to correct those errors. Ball et al. (2008:400) define SCK as 'the mathematical knowledge and skills unique to teaching' and include tasks such as 'finding and selecting appropriate examples or resources to present mathematical ideas, modifying tasks to be either easier or hard'. The following question specific to this domain was included in the questionnaire: 'What would you do when you have planned an activity for learners to count 5 objects and you discover that some learners find the task too easy?' This is one of the daily tasks that teachers perform during the teaching and learning of numeracy, to adjust or to modify the content to accommodate all learners. The task requires unique mathematical understanding and reasoning; therefore, teachers need to possess knowledge beyond what is taught to learners. They should be able to understand various interpretations of the mathematical problems or concepts in order to be able to make the content visible to or learnable to learners (Ball et al. 2008). The ways in which teachers do these tasks show how they understand and teach mathematical content to learners. Findings showed that teachers' understanding of modifying the content to accommodate all learners differs. Some teachers provided sensible activities. For example, Teacher 7 reported that she would vary the counting activity by involving the learners in a fun activity where they shake a container with counters in it, listen to the sound and then guess the number of counters in the container (see figure 7). Teacher 8 indicated in Figure 8 that he would extend the counting task by allowing them to count more than five objects. Many teachers however did not seem to recognise what the problem was. Teacher 9, for example, suggested using group work in Figure 9. Teacher 9 indicated that to accommodate learners who find the counting of five objects too easy, she would divide learners into groups so that those who understand the tasks become group leaders and help those who experience difficulties with the task, for collaborative learning to be enacted. However, her response was not related to the main issue of developing an extended activity for learners who are well able to count five objects. 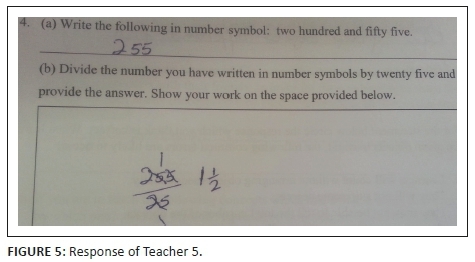 Another teacher (10) also seemed to have misunderstood the demand of the question, as indicated in Figure 10. Teacher 10 seemed to have understood the question differently because he responded by indicating materials such as stones that he would use when teaching counting instead of addressing the modification of the question so that it could present something a little more challenging. He further indicated that he would teach them to count starting from left to right. These responses revealed that some teachers do not seem to have access to SCK for numeracy instruction, which requires skills unique to teaching. They could not demonstrate some of the practices that they need to employ in their everyday teaching of numeracy. There were 30 teachers who showed an understanding that content needs to be modified when the need arises, that is, when learners may find the planned activity too easy or too difficult. Furthermore the ways in which they modified the instructions did not compromise the numeracy concepts while giving learners an opportunity to explore the same content more broadly. The practices involve the ability to anticipate things that learners are likely to find difficult or too easy and to then employ strategies that can be used to modify numeracy content to suit most if not all learners. As noted by the Mathematics Learning Study Committee (2001), effective teaching of numeracy involves listening to and understanding the expression of learners' numeracy ideas and then providing appropriate responses by interpreting learners' work, then analysing their reasoning. The teachers' difficulties in responding immediately in modifying the content presented to learners, prevents teachers from mediating the numeracy content in a manner that is effective and learnable for learners. · Learners will count without arranging objects sequentially. · They will not skip some objects. · They may not be able to tell the total number of the objects. · They may continue counting endlessly. · They may repeatedly point at the same objects when counting. It was evident that the teachers experienced challenges in identifying the common errors that are likely to be made by learners while counting. We found that 83% of the teachers could not circle all correct statements. Teacher 11 circled the first statement in Figure 11 and did not circle the other three statements (C, D and E), while other teachers circled two or three statements. However, 17% of teachers were able to circle all four statements that portray errors that Grade R learners are likely to do while counting; for instance, refer to the response of Teacher 2 in Figure 12. The responses of 27% of teachers provided evidence that they were aware that learners progressed through different levels of counting because they were able to indicate the level at which the learners could be. However, 33% of teachers did not give answers to the question, while the responses of 40% were unrelated to the issue. Teachers who cannot recognise levels of progression through the understanding of the concept would assume that the concept is simplistic and easily understood. They may also not recognise that different learners need different levels of support in developing the understanding of number. In general most of the teachers' responses to the question suggest that they were not aware that there are different levels of understanding of counting and learners' responses could be used as indicators of the levels through which they have progressed. Knowledge of content and teaching is defined as 'a combination of knowing about teaching and knowing about numeracy' (Ball et al. 2008:401). Tasks that teachers need to demonstrate involve designing the instruction, sequencing content, choosing relevant examples to start the lesson and those that can be used to take learners deeper into the content and to decide on appropriate teaching methods. For teachers to execute these practices they should possess an understanding of pedagogical issues that affect the learning of numeracy. 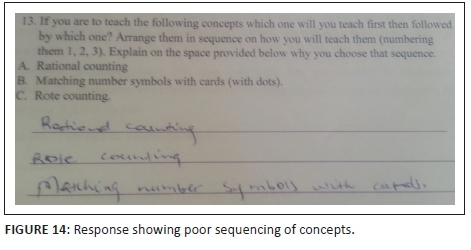 In order to explore how the teachers' KCT played a part in their instruction, the questionnaire had a question that required teachers to arrange the listed numeracy concepts or skills (rational counting, matching number symbols with dotted cards and rote counting) and show the sequence on how they should be taught and to then to support their answer. The findings revealed that the teachers' knowledge of the concepts, in terms of how they were supposed to arrange them sequentially for teaching, differed. 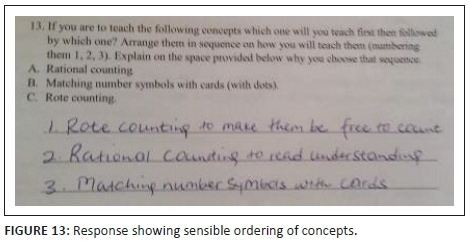 The teachers presented different arrangements, with only 15% of teachers being able to order the concepts, indicating which concept follows each other in the development of counting. For instance, one teacher provided further details about the importance of each of the steps, as shown in Figure 13. Many teachers provided a sequencing but did not give a reason for the sequence that they provided. They were unable to explain that each level is a prerequisite skill for another level. The sequencing of a concept as elementary as counting is a crucial issue for learners. It was also found that 85% provided arrangements that were different from that advised in curriculum documents (DoBE 2012), indicating that they did not have appropriate knowledge of the concepts. For instance, Figure 14 presents an example of poor sequencing. Hence, it is evident that the majority of teachers struggle with sequencing of the content, with only 15% of the teachers correctly identifying the progression in complexity of the concept of counting, which is an integral part of KCT. A recent study found similarly that teachers found it difficult to identify links and progression between mathematical concepts (Umugiraneza, Bansilal & North 2018). In a study conducted with 75 mathematics teachers, it was found that only 14% of the teachers were able to identify vertical alignment suggestions for particular topics, showing that many teachers are not easily able to recognise how mathematics concepts progress in complexity across different levels (Umugiraneza et al. 2018) The results here suggest that teachers may need more professional development opportunities focused on unpacking these connections. As a result their learners may be deprived of an opportunity to be exposed to the numeracy content that will provide them with the strong foundation of mathematics that is necessary for understanding mathematics in the later stages of school. This article focused on the mathematics knowledge for teaching of numeracy as revealed by the written responses of 48 practising Lesotho Grade R teachers. The findings of the study revealed that some of the Grade R teachers did not have a profound understanding of common content mathematical knowledge of numeracy concepts, with some teachers being unable to carry out division problems accurately. When probed about tasks related to modifying the content that was planned, only 30 teachers were able to provide sensible suggestions. Only 27% of the group were able to explain that there were levels of understanding numeracy, and when asked to order a sequence of three topics only 15% of the teachers produced a reasonable sequence. These results show that the teachers need much support in building up various aspects of their professional knowledge. In this regard, the theoretical framework provided a useful and appropriate rubric in helping us specify the main variables that impact on the Grade R teachers' abilities, skills and knowledge. This framework of MKT also allowed us to identify how the variables differ from teacher to teacher. Competence in numeracy forms a foundation upon which further development and understanding of mathematics is dependant, and Grade R teachers need to have a profound understanding and knowledge of numeracy concepts for this grade in order to be able to practise effective teaching of numeracy. It is also crucial for teachers to be able to intentionally plan and organise their instructional activities, so that the learners can progress through the levels of understanding. These teachers' difficulties raise concerns about the effectiveness of their teaching of numeracy. Despite the Lesotho government's commitment to improving the learning of mathematics at the Grade R level, much more work is required to be conducted with teachers so that their MKT numeracy can be improved. Funding for this study was provided by the Kellogg Foundation. M.S. was the doctoral student who was supervised by S.B. and A.J. As the principal researcher M.S. was responsible for the data collection and the initial draft of the manuscript. S.B. worked on the conceptual alignment and refinement of the manuscript, while A.J. refined and edited the article. Atweh, B., Bose, A., Graven, M., Subramanian, J. & Venkat, H., 2014, Teaching numeracy in pre-school and early grades in low-income countries, Gesellschaft für Internationale Zusammenarbeit (GIZ) GmbH, Deutsche. Department of Basic Education (DoBE), 2012, Mathematics handbook for foundation phase teachers grade R-3 CAPS Edition, Department of Basic Education, Pretoria. Epstein, A.S., 2007, The intentional teacher: Choosing the best strategies for young children's learning, National Association for the Education of Young Children, Washington, DC. Ginsburg, H.P. & Ertle, B., 2008, 'Knowing the mathematics in early childhood mathematics', in O.N. Saracho & B. Spodek (eds. ), Contemporary perspectives on mathematics in early childhood education, pp. 45-66, Information Age Publishing, Charlotte, NC. Lesotho College of Education, 2007, Curriculum for the Certificate in Early Childhood Education (CECE) Programme, Lesotho College of Education, Maseru. Lesotho. Ministry of Education and Training, 2005, Education sector strategic plan 2005-2015, Paragon Business Products, Maseru. Mathematics Learning Study Committee, 2001, Adding it up: Helping children learn mathematics, National Academies Press, Washington, DC. National Council for Teachers of Mathematics (NCTM), 2013, Mathematics in early childhood learning. A position of the National Council of Teachers of Mathematics, viewed 10 May 2018, from www.nctm.org/earlychildhoodmath.